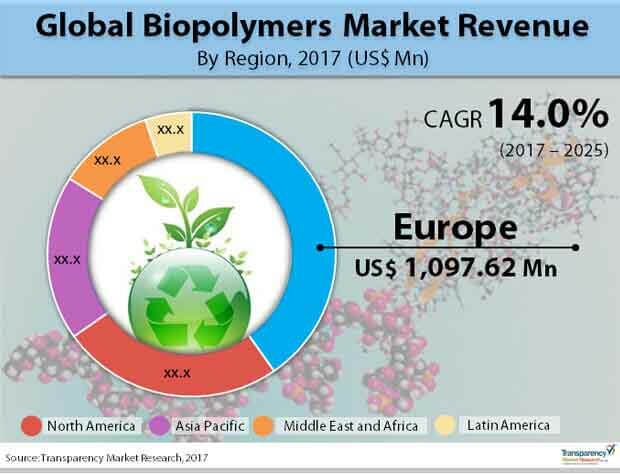 The global biopolymers market features a largely consolidated landscape as a relatively small number of companies account for the leading shares, notes Transparency Market Research (TMR). Some of the top players operating in the market are E.l.du Pont de Nemours and Company, Galatea Bio Tech, Total Corbion, Danimer Scientific, Novamont S.p.A, NatureWorks LLC, Archer Daniels Midland Company, Plantic Technologies Ltd., FMC Biopolymer A.S., and BASF SE. The leading players are focused on ramping their investment substantially for developing products for various major end-use industries, including consumer goods, packaging, and agriculture, in a move to consolidate their shares. In the coming years, several prominent players are focusing on tapping vastly emerging opportunities in emerging markets increasingly inclined toward the adoption of green industrial products, in order to gain a competitive edge over others. The global biopolymers market was valued at US$2,422.1 mn in 2016 and is projected to reach a worth of US$7,774.7 mn by the end of the forecast period. The market is estimated to expand at a CAGR of 14.0% CAGR from 2017 to 2025. The various types of biopolymers are bio-PET, bio-PE, biodegradable starch blends, PHA biodegradable polyesters, PTT, PLA. Of these, the biodegradable polyesters segment currently holds the leading share, on account of a host of amazing features, notably biodegradability and biocompatibility. The various regional markets for biopolymers are North America, Europe, Asia Pacific, Latin America, and the Middle East and Africa. Of these, Europe accounts for the leading global share in 2016 and is anticipated to generate revenue of US$3,082.38 mn by the end of 2025. The dominance of the regional market is attributed to heightened awareness toward environmental-friendly and sustainable practices adopted by the European Union, which has led to the substantial uptake for green products. The rising awareness toward the adoption of eco-friendly, cost-effective and sustainable practices world over is continuously stoking the global demand for biopolymers. The growing initiatives in various end-use industries, most notably in packaging, toward the demand for products that leads to lower carbon emissions are a crucial factor driving the market. The growing worldwide awareness about the environmental hazards of plastics usage has led end-use industries increasingly regulate the use of conventional polymers, thereby boosting the market. The growing impetus toward industrial practices that promote low-carbon economy is a prominent factor catalyzing the growth of the market. The rising uptake of biopolymers in the packaging industry, on account of a host of favorable physical characteristics, is a notable trend accentuating the growth of the market. The pressing need for high-performance and cost-effective materials in the packaging industry is a crucial factor fortifying the uptake. On account of marked barrier properties of biopolymers and biodegradability features, they are widely being demanded in a number of packaging applications. Coupled with other eco-friendly attributes, biopolymers are witnessing extensive demand in industries such as agriculture, electronics, textiles, consumer goods, and construction. A variety of functional attributes of different types of biopolymers is a key aspect expected to fuel their demand in the years to come. However, the high cost of production of biopolymers, lack of production technologies in various emerging regions, is notable factors hindering the growth of the biopolymers market. Nevertheless, the convenient availability of feedstocks for manufacturing biopolymers is a key factor bolstering the demand for biopolymers. Furthermore, the growing popularity of natural polymers and their preference over synthetic polymers in a number of biocompatible applications in end use industries are key aspects favorably impacting the market. In addition, these are gaining traction in manufacturing next generation polymeric materials.